Reporting from Sri Lanka at the moment is extremely difficult. There is no independent access to the northern war zone, or to the thousands of Tamil civilians who have crossed over to government-controlled territory. The only regular sources of information are the government on one side, and websites sympathetic to the Tamil Tigers (LTTE) on the other. There is a propaganda war alongside the conflict on the ground, and confirming details of what is going on is all but impossible. Many journalists covering South Asia have been unable to get visas to travel to Sri Lanka. Some have tried to enter the country as tourists and have been turned back at the airport. Those who do try to travel to the north independently are stopped at a series of checkpoints far away from the war zone. The government says this is a necessary precaution to ensure that journalists do not come to any harm. Critics in the local media are under extreme pressure. Several independent journalists have been killed in the past few years. 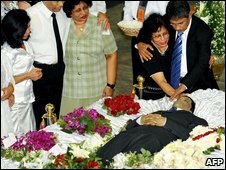 One leading newspaper editor, Lasantha Wickrematunga, was shot dead on his way to work in Colombo this year. The government denied any responsibility for his death. But in an editorial he was said to have written a few weeks before he was killed, and which was published after his death, Mr Wickrematunga's accusation was clear. "When finally I am killed," he wrote, "it will be the government that kills me." The past few months have been one of the most challenging times to report from Sri Lanka, but this has never been a particularly easy war to cover. The Tamil Tigers have now been pushed into a tiny corner of the country. But they have always ruled any areas under their control with an iron hand. Dissent has never been accepted - and many Tamil critics of the LTTE have been murdered over the years. The Sri Lankan authorities have also become intolerant of criticism. Defence Secretary Gotabaya Rajapakse told me during a trip to Sri Lanka this year that in a time of war all dissent was treason. A few days later, in a front-page newspaper report, he accused me of supporting the Tamil Tigers and threatened to "chase me out" of the country. The United Nations, the International Committee of the Red Cross, and several foreign embassies have also been the target of criticism. After more than 25 years of civil war, Sri Lanka senses that the defeat of the LTTE is at hand. But the lack of independent accounts of what is happening in the north has given rise to growing concern around the world. "How the war ends will be critical to Sri Lanka's future," argues Robert Templer, the Asia director at the International Crisis Group. "Will it be in a bloody massacre whose memory will be used to incite decades more war and terrorism? "Or will we see renewed efforts to find a negotiated end to the fighting, and with it, the possibility of building a new, more peaceful Sri Lanka for all its people?"